Notable speakers for the International Forum on One Korea included former U.K. ambassador to North Korea John Everard, former Chinese Ambassador to the U.N. Guofang Shen, former Mongolian president Punsalmaa Ochirbat, Russian Academy of Sciences’ Center for Korean Studies director Alexander Zhebin, and India’s Institute for Defense Studies and Analyses’ East Asia Center Coordinator Jagannath Panda. The following article from The Korea Times highlights GPC 2019 and the issue of unification on the Korean peninsula. The Global Peace Convention discussed the issue of unification of South and North Korea in Seoul as crucial talks on denuclearization took place between the U.S. and North Korea in Hanoi last week. The convention was held marking the 100th anniversary of the March 1 Independence Movement that took place under Japan’s colonial rule in 1919. A total of 1,200 participants from 40 nations, including security experts and scholars, took part in the three-day convention hosted by the Global Peace Foundation at the Lotte Hotel and President Hotel in central Seoul, Feb. 26-28.
Notable speakers included Chinese People’s Political Consultative Conference member Han Fangming, former U.K. ambassador to North Korea John Everard, former Mongolian president Punsalmaa Ochirbat, Russian Academy of Sciences’ Center for Korean Studies director Alexander Zhebin, Religious Freedom and Business Foundation President Brian Grim and India’s Institute for Defense Studies and Analyses’ East Asia Center Coordinator Jagannath Panda. Various forums discuss unification, each focusing on the role of youth, female leadership, education, as well as establishing a lasting peace regime on the Korean Peninsula. Panelists of the One Korea International Forum, including Everard, Zhebin and former Chinese Ambassador to the U.N. Guofang Shen, supported South Korea-led efforts for unification, independent of interventions by foreign powers. They also agreed on the importance of the Korean people playing an active role in the process. 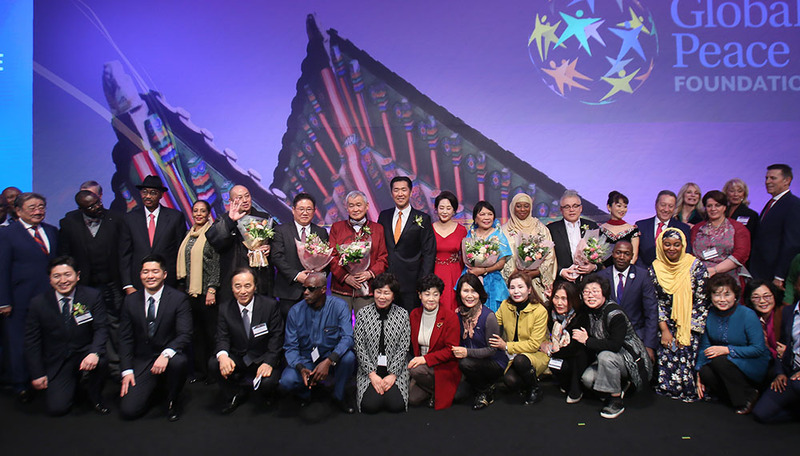 “For Koreans, whose fate had been determined by foreign powers throughout the 20th century, the need for independent self-realization is a powerful force,” the foundation chairman Moon Hyun-jin said in a keynote speech at the convention’s plenary, Feb. 28. The issues of religious freedom and the poor human rights situation in North Korea were also discussed. Participants at the convention also attended a One K Concert at the front of the National Assembly on Friday, marking the anniversary of the March 1 Independence Movement. Korea was liberated from Japan’s 1910-1945 colonial rule after Japan’s defeat in World War II. However, it became divided as forces of the Soviet Union occupied the North and the U.S. the South, with the 38th parallel serving as the boundary. The Korean War broke out as the North invaded the South in 1950, and ended in an armistice in 1953, leaving the Koreas divided by the demilitarized zone and still technically at war today. Declaring an end to the Korean War has been discussed in denuclearization negotiations between North Korea and the U.S. The Global Peace Convention was first held in the Philippines in 2009 and has been hosted in the U.S., Kenya, Malaysia and Paraguay. The Global Peace Foundation is an international nonprofit organization with headquarters in Maryland in the U.S., with initiatives in 22 countries. The chairman’s father, Moon Sun-myung, founded a religious movement known as the unification movement.